This is ‘Black Cherry’ in my Plano, Texas garden. Thrilled to locate it at Jackson & Perkins its in this garden now! It came in a 2 quart container! The question most often asked of me at the Chicago Flower & Garden Show while I worked at the rose garden promoting membership in the American Rose Society for ten days all day every day was, “where can I find roses like yours?” Thanks to Jackson and Perkins now you can have the varieties of roses you see in my pictures without the grief I had locating them. 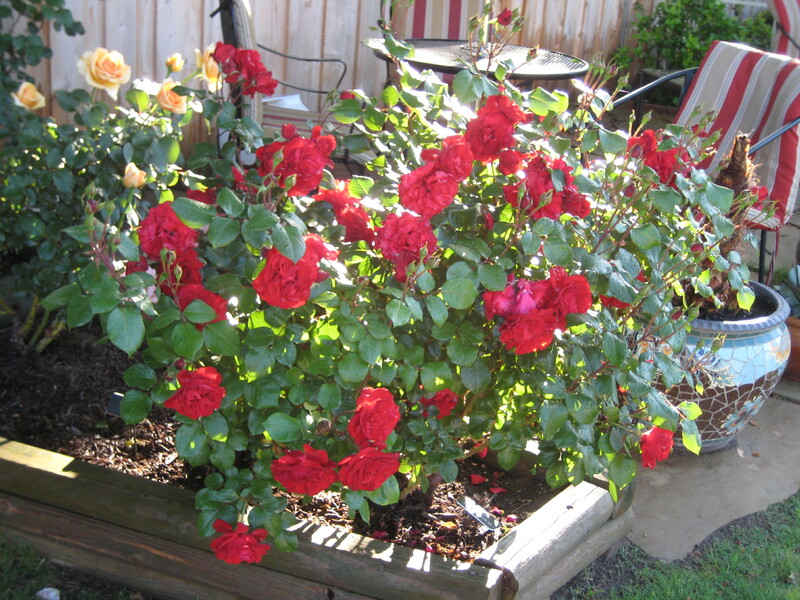 In a populated metroplex I had become used to selecting roses from a landscape & garden center that had roses nicely potted in containers placed all in a row, alphabetized by their name that published the list of availability a season in advance to download. Moving to a rural area was a wake-up call and a learning experience. As a totally spoiled DFW Metroplex dweller, the garden center I chose my roses from delivered them in 5 gallon containers on a flatbed truck. They also list their roses each year on their Web site in the fall of each year announcing the roses that will be available in February of the next year. 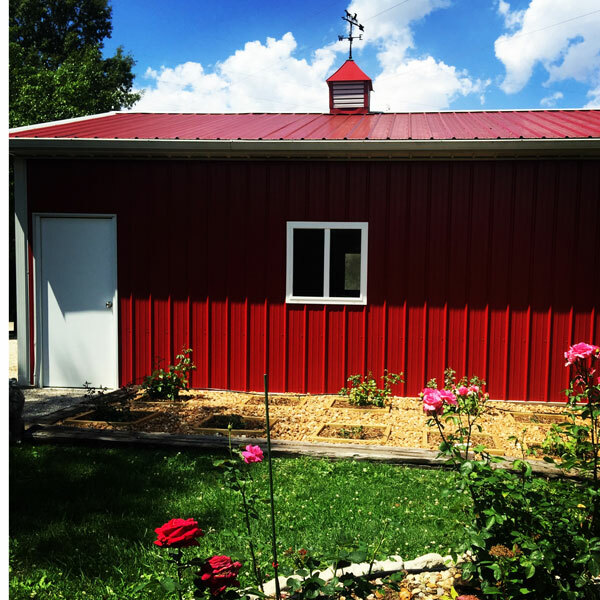 In this rural area of Illinois now like so much of the country where so many folks live that want roses, the closest garden center that sells any potted roses in containers is 80 miles away. Then when I drove to this garden center I found the selection wanting because after having a discussion with the owner of the Landscape Center on how he arrived upon his rose buying decisions the family run store said he gave the order form to an employee and they selected roses based on whether they liked the names. His inventory had already told the story. Roses that were ‘out of patent’ that had great names were sitting on his floor. Spoiled pampered Gentrified Urban Rosarian that I was I thought I would waltz into the local Garden Center and select my container roses growing in 5 gallon pots and have all the roses I needed ordered and delivered to my new gardens. Wrong. The closest Landscape & Garden Center with any selection of container roses is 80 miles away and they didn’t then and still don’t carry the varieties I want. So let’s talk about the facts. This leaves a minority of 27.5 million rural residents living outside the metropolitan areas.Metropolitan areas are defined by OMB as labor markets with core urban areas between 10,000 and 50,000, and are not considered metropolitan. Approximately 98.5 percent of the land in micropolitan areas is rural. The rural population of micropolitan areas is 13 million. other 14 million rural residents live outside the micropolitan areas. However, there are still 4.7 million urban residents outside both metropolitan and micropolitan areas, with each of these urban areas having fewer than 10,000 residents. 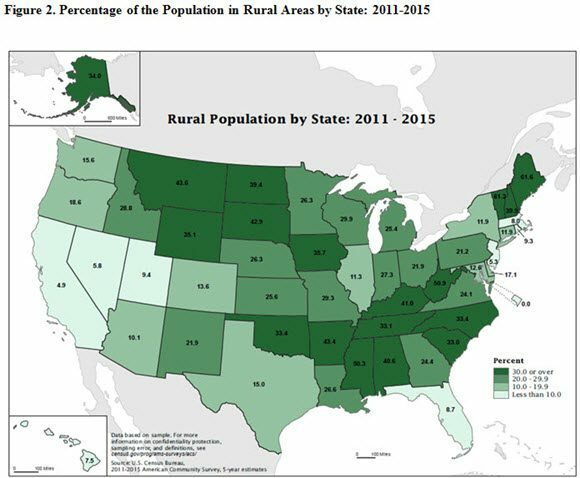 Even where America is most urban, a strong rural element remains. This is illustrated in the Northeast Corridor, the “megalopolis” defined by Jean Gottman more than a half-century ago. The urbanization he identified is still short of continuous along the corridor. Rural areas interfere with urbanization in parts of Maryland, New Jersey, Connecticut and Massachusetts. Nearly 60 percent of the land area in these adjacent metropolitan areas remains rural (Figure 5). Question: Where Do You Get Your Roses Now? I get my roses from the one of oldest most trusted brand names in America, a name that is synonymous with roses: Jackson & Perkins. I remember my mother buying roses and trusting Jackson & Perkins as her rose source. Now the 3rd rose garden has been transitioned back to where my heart leads me. It’s a Jackson & Perkins test rose garden. It has 4 Jackson & Perkins roses that as of yet are unmanned. Some of the most famous rose breeders have worked with Jackson & Perkins. The roses in the garden are in the list below, you can click and vote on whether you like them. The biggest surprise I have saved for last. 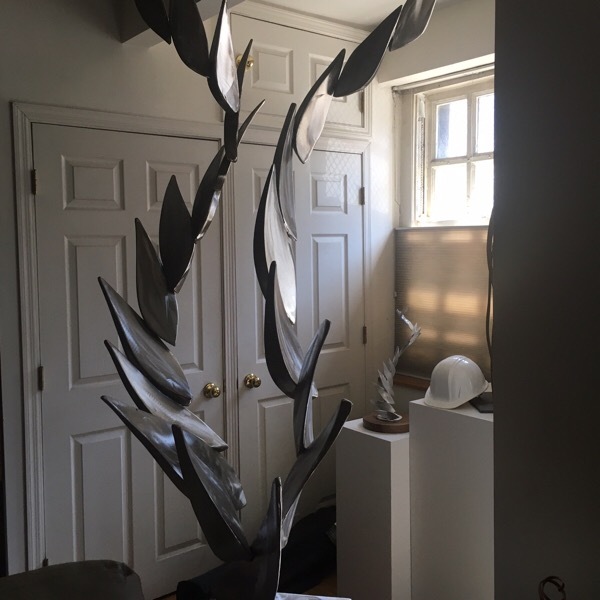 While in Chicago I worked, as you know representing Chicago Flower Show Director, Tony Abruscato and he partnered with Chicago Sculpture Exhibit. The artists would come and spend some time at the rose garden where we had their sculptures. Since I was there full time representing the rose garden, I also spoke for the sculpture artists as well. Michael Young is an artist that I ended up promoting and I believe we may have sold some of his pieces and the piece that was on display. Soon we hope to have a Michael Young Sculpture to set off the beauty of this Jackson & Perkins exquisite Rose Garden. 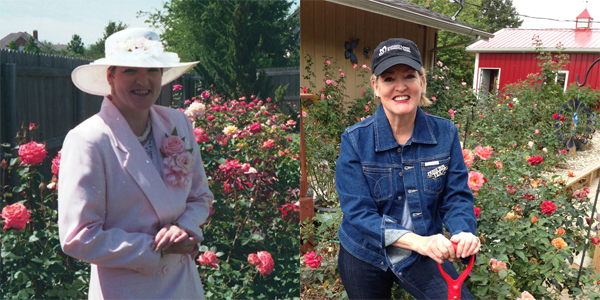 Your comments & shares are welcome especially that I support the American Rose Society that offers so much in return for a minimal investment. Its one of the few memberships that still print a beautiful magazine 6 times a year with valuable educational information, a newsletter and an invaluable tool to choose roses: The American Rose Societies handbook for Selecting Roses, and once a year the Rose Annual. I have contributed articles to the newsletter, magazine and the Rose Annual, and would be happy to provide you with a copy of each. 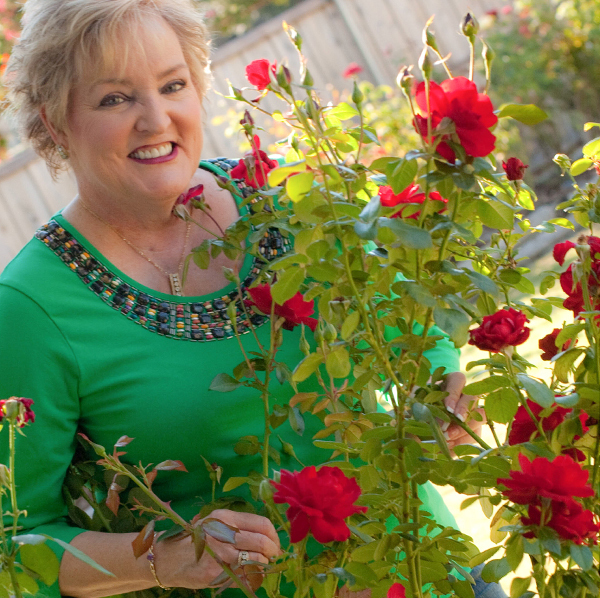 *The Texas Rose Garden won Dallas Rose Society ‘Best Large Garden’ and was on the Plano Garden Tour, and was the recipient of many photography awards, blue ribbons as well, request rose bio for a list of all awards. Hello, I found this post when searching for info on the j&p Aromatherapy hybrid tea that we planted in Spring 2017. It seems to be gone from their website. Was it a test rose that flunked? Or something? Ours is blooming now inOct-Nov. After the 100 degree summer days here in Fresno, CA. But the flowers are bright YELLOW! NOt pink! Whats up with that? Let me check for you because I got ‘Aromatherapy’ last spring from Jackson and Perkins. It could be out of stock. I’ll get back to you with the information. Thank-you for your comment. I hope you will be a frequent visitor. Did you see ‘Sugar Plum’? I love that rose as well, and ‘Black Cherry’. ‘Black Cherry and ‘Kimberlina’ are exclusive to Jackson and Perkins, please go to http://www.facebook.com/gagasgarden and check out the video of ‘Kimberlina’. It should do greta in CA weather. If you have any questions don’t hesitate to contact me here on the site.